Scarborough RUFC captain Matty Jones insists his side aren’t too down in the dumps after their 34-13 defeat at North One East title rivals Morpeth. Jones and his teammates have stunned onlookers by taking North One East by storm after their promotion from Yorkshire One last season. The club set out with the ambition of consolidating, but have surpassed that and are still joint top of the table despite their fourth defeat of the season. “It’s important that we don’t place too much emphasis on Saturday,” said Jones. “It’s about how we react to this defeat and bounce back against West Leeds on Saturday now and the boys will be keen to get back to our best after a below-par performance at Morpeth. 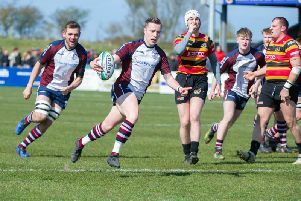 Jones admits coach Simon Smith set a target of nine points from 12 in January, and victory at Silver Royd on Saturday would wrap that up for Scarborough. “We’re on course to achieve our points target for January, provided we get back to our best on Saturday.